Aimee Petras, Education & Outreach Coordinator for the Farmington River Watershed Association wants you to get your lawn in shape without using chemical fertilizers or pesticides. Skeptical? Attend her upcoming workshop on April 29 from 9-10:30 am at Winding Trails in Farmington. She will outline tips for mowing, seeding, watering and ways to manage common weeds and pests that can complicate natural lawn care. You will leave knowing steps you need to take including getting a soil test through mowing techniques. Additionally, we’ll delve into common lawn problems such as grubs and thatch. Registration is required by three days prior. Register here: https://www.windingtrails.org/register/?id=717. This Regional Forum will feature Dr. Edward Faison, Senior Ecologist from Highstead, a regional organization in Redding, CT dedicated to forest research and long term monitoring. Dr. Faison will present information on how municipalities and land trusts can establish a landscape and historical approach to stewarding our protected preserves and better understand How, When and Why we should monitor and manage our forests. We will provide a light supper at 6:00 pm with the program starting at 7:00 pm on April 17 in the Program Room at the Simsbury Public Library, 725 Hopmeadow Street, Simsbury CT. Questions and RSVP’s (by April 10th) to Helen Peterson, hkpeterson@comcast.net. Just two weeks after reintroducing the bill in the Senate, U.S. Senator Chris Murphy (D-Conn.) and U.S. Senator Richard Blumenthal (D-Conn.) applauded the U.S. Senate Energy and Natural Resources Committee on Thursday for passing the Lower Farmington River and Salmon Brook Wild and Scenic River Act – legislation Murphy has sponsored since serving in the House of Representatives that would create a U.S. National Park Service protective designation for the Lower Farmington River and Salmon Brook. The bill, which was introduced in the U.S. House of Representatives by U.S. Representative Elizabeth Esty (CT-5) and cosponsored by U.S. Representative John Larson (CT-1), now awaits passage in the Senate. With protective designation as a “wild and scenic river,” the Lower Farmington River and Salmon Brook – which runs through ten Connecticut towns – could receive as much as $100,000 in federal funding to assist volunteers and officials with conservation efforts. The upper portion of the river was given protected status in 1994. Murphy, Esty, Blumenthal, and Larson have continuously pushed for the Lower Farmington River’s Wild & Scenic designation. Last year, the U.S. Senate unanimously passed the Lower Farmington River and Salmon Brook Wild and Scenic River Act for the first time ever. Former U.S. Representative Nancy Johnson, who was Murphy’s predecessor in the U.S. House of Representatives, helped enact legislation that initiated the study on which the Lower Farmington River and Salmon Brook Wild and Scenic River Act is based. The study was completed in 2011 and confirmed the suitability of designating the Lower Farmington River and Salmon Brook as Wild & Scenic. HARTFORD, CONN. – Eight organizations from across Connecticut are coming together to celebrate water on United Nations World Water Day, March 22. “Water sustains life in all forms on Earth. In Connecticut, The Nature Conservancy works with private citizens, businesses, other nonprofits and public agencies to protect water quality, stream flows, aquatic and wetland habitats and our coastlines—for people and nature,” said Sally Harold, director of river restoration and fish passage for The Nature Conservancy in Connecticut. “The Farmington River and Salmon Brook are some of Connecticut’s most treasured resources that provide natural beauty, support ecological diversity, and recreational opportunities for residents and visitors. I am pleased to join my colleagues in reintroducing this legislation to designate these rivers as ‘wild and scenic’. This designation is crucial in protecting this body of water for generations to come,” said Larson. The Lower Farmington River and Salmon Brook runs through the following Connecticut towns: Avon, Bloomfield, Burlington, Canton, East Granby, Farmington, Granby, Hartland, Simsbury, and Windsor. The upper portion of the river was given protected status in 1994. Murphy, Esty, Blumenthal, and Larson have introduced similar legislation previously, and have continuously pushed for the Lower Farmington River’s Wild & Scenic designation. Last year, the U.S. Senate unanimously passed the Lower Farmington River and Salmon Brook Wild and Scenic River Act for the first time ever. Former U.S. Representative Nancy Johnson, who was Murphy’s predecessor in the U.S. House of Representatives, helped enact legislation that initiated the study on which the Lower Farmington River and Salmon Brook Wild and Scenic River Act is based. The study was completed in 2011 and confirmed the suitability of designating the Lower Farmington River and Salmon Brook as Wild & Scenic. The Farmington River Watershed Association (FRWA) is a well-established non-profit citizens group whose mission is to preserve, protect, and restore the Farmington River and its watershed through research, education, and advocacy. One important way to restore the river is by reducing stormwater runoff. 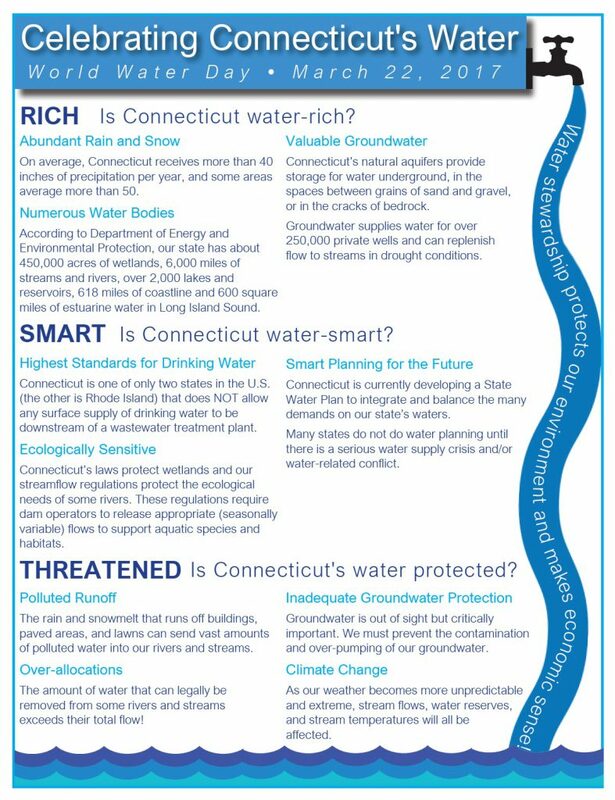 Stormwater pollution remains the leading cause of poor water quality in the Farmington basin; it also degrades the receiving waters of Long Island Sound. For FRWA, engaging people in stormwater pollution prevention is a high priority. FRWA seeks an experienced outreach staffer to help coordinate and lead “River Smart Outreach for Runoff Reduction,” a grant-funded program to foster good water stewardship by youth and other groups in urbanized communities in and around the Farmington River watershed. This is a part-time position funded through Dec. 2017. Hours will vary, averaging 10-12 per week but ranging from zero to about 20 depending on demand. Evening and weekend hours are occasionally required. The Assistant Project Manager will report to the Outreach and Education Coordinator, and work with all three of FRWA’s full-time staff on project implementation. Is personable, self-motivated, imaginative, creative, detail-oriented, and genuinely enjoys challenges and building working relationships with a variety of people. Has excellent verbal and written communication skills, can edit websites and use various social media to enhance participation, and can help design vibrant publications and displays. Has a strong interest and background in river protection, pollution prevention, Long Island Sound, or related environmental issues. A degree in biology, natural resources, or related field is a plus. Has successfully coordinated community groups /volunteers for programs, events, or workdays. Has led youth groups in outdoor field trips, education programs, and/or hands-on projects. Helping FRWA grow relationships with organizations and watershed residents. This entails phone calls and emails, scheduling meetings, preparing meeting materials, following up on action items, and maintaining contacts over time. Working with FRWA staff to schedule programs and events and organize them. This entails proactive planning, coordinating partners, confirming times, places, and participants, creating and distributing publicity, gathering and providing materials, guiding volunteers, etc. Helping develop an interactive River Smart exhibit to be used at public events and venues. This may entail researching exemplary traveling exhibits, locating and pricing source materials, writing text, assembling the display, testing various activities with audiences, seeking out appropriate events and venues, and scheduling use of the exhibit. Presenting River Smart and other material in person at libraries, museums, local festivals, etc. Facilitating and documenting actions taken by participants in the River Smart pledge program, and following up with individuals as needed. Helping lead field trips or other activities for students / youth group(s) involved in River Smart. Posting River Smart stories and successes on social media and/or website blog, using online tools that maximize reach and feedback. Keeping clear, up-to-date records and providing complete, timely reports as needed. Starts at $15/hr; higher rate for exceptional candidate may be considered. Position may require a background check. Deadline March 15 or until filled. The Farmington River Watershed Association (FRWA) is accepting applications for two River Stewards for summer 2017. River Stewards will work in the field, laboratory, and office on several projects, including weekly water quality sampling and analysis; assessments of aquatic animal passage at road-stream crossings as weather permits; outreach (live and online) to promote safe and responsible river recreation; and assisting with FRWA’s “River Smart” outreach activities. Overview. River Steward seasonal staff are based in FRWA’s office in Simsbury, CT. They have responsibilities typical for entry-level professional positions in watershed associations (details below). Their work entails travel throughout watershed towns as needed. Seasonal staff are expected to work up to 24 hours per week, depending on need and weather, for up to 11 weeks from late May or early June through early to mid-August. Most work is during regular weekday hours; early morning or early evening hours are sometimes needed. Public education and outreach. This may entail face-to-face interaction with recreational users to encourage safe practices and good river etiquette, maintaining a lively online presence for FRWA on our website and in social media, and participating in programs, events, and field trips for youth and the general public. A high priority in summer 2017 is assisting with FRWA’s “River Smart” outreach program. Its objective is to engage people in adopting practices that reduce polluted stormwater runoff. Compensation. $10 per hour. Travel to field sites will be compensated at $0.54 per mile. This position may require a background check. Deadline. Applications will be accepted until positions are filled. Hiring decisions are anticipated in April or early May. Background. The Farmington River Watershed Association (FRWA) is a community-based organization founded in 1953 with a mission of protecting the Farmington River and its watershed lands in Connecticut and Massachusetts. The Farmington River boasts a renowned trout fishery in its West Branch (a federally designated Wild & Scenic River) and excellent paddling, including the famous whitewater of Tariffville Gorge. Multi-use trails along its banks enhance quality of life in riverside towns. Its East Branch (now a reservoir) supplies high-quality drinking water to greater Hartford. However, the river’s well-being requires ongoing community engagement and action. FRWA mobilizes people to watch over and maintain the natural features and functions of this remarkable river. FRWA’s primary mission activities are Research and Stewardship (hands-on water quality monitoring, field assessments, and habitat restoration); Education (programs, classes, workshops, field trips, online and print media about pollution prevention, watersheds, and other topics); and Advocacy (promoting changes in personal behavior or public policy that enhance river health and public health). For more information, see www.frwa.org. Monitoring website and social media; tracking and enhancing the reach of posts; taking photos for posts and publications. Working with staff to prepare and send timely reports, filings, and other communications to agencies, foundations, and donors. Coordinating and supporting volunteers as needed. Planning and preparing for events, workshops, programs, and work days. General administrative support, such as responding to selected email and phone inquiries; troubleshooting technical issues; or updating FRWA procedures, manuals, and core documents as needed. Qualifications. The ideal candidate has excellent “people skills,” writes and speaks well, knows Microsoft Office, can work independently, learns quickly, communicates clearly, enjoys keeping a multi-faceted organization running smoothly, likes to organize, is very detail-oriented, contributes to a cheerful and positive team atmosphere, and embraces FRWA’s mission. Experience at an environmental non-profit and technical knowledge about river stewardship are desirable. Experience in customer service, social media marketing, contract reporting, volunteer coordination, development, business administration, or non-profit administration could all be advantages. Compensation. This is a 1-year part-time position, with a possible extension contingent on funding. Schedule negotiable; up to 8 hrs/week, on 1-2 days during normal business hours. Hourly rate dependent on experience (starts well above minimum). Coordinator Job Search, FRWA, 749 Hopmeadow St, Simsbury, CT 06070, or efielding@frwa.org. Deadline. March 15 or until filled.